4. Automatically as cards move to lists or on a regular schedule by using Butler. 5. From any mobile or browser using our web app, mobile app or power-up. Plus is flexible and used in many different ways. 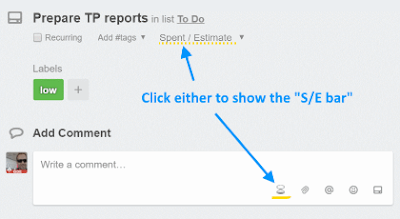 To use effectively first read about concepts like entering card "Spent" (S) and "Estimates" (E), decide if you will track estimates, permissions and so on. ☑ Configure a sync method. Read about it from the help pane Sync section. As you change the sync selection, Plus shows help there listing features and comparing with other methods. More here. Spent Units: minutes, hours, days? Week numbering: week starts on sunday by default unless you change it there. Background sync: So it syncs even if you don't open Trello so the Plus menu and reports and always up to date. Disabled by default. Estimates, Remaining, Timer preferences and settings for parsing S/E from card titles (for your Scrum for Trello S/E) and many more options. Type S/E in the boxes, press Enter. Add a known amount to the existing user's S/E in this card, manually or with a card timer. By default, the user is "me" (you). Click it to change the user that this S/E will be applied. When using estimates, your first entry in a card will just be the Estimate, leaving spent empty. If you did not previously estimate the card, entering the Spent will automatically fill the estimate to be the same as Spent (thus entering the Spent and Estimate at the same time, in the same S/E row). Once you enter this first "S/E row" for the card, you may enter more S/E rows for the same card. Those will add to your existing ones. This is a key concept in Plus. Your first row (per card per user) contains the "first estimate" or "E 1ˢᵗ". For those tracking changed estimates, reports can compare "E 1ˢᵗ" with current E.
If you keep adding "S" through the S/E bar, it will keep auto-completing the "E" field whenever you type a Spent that would make total S bigger than total E (for that card, for that user). When you pause a timer, the S/E bar is used to pre-fill that Spent. You then have a chance to modify the E or Note, then Enter the new row. This is great when adding known values to the S/E totals. However, when you want to modify the total Estimate or make corrections, you would need to calculate the needed "delta" (positive or negative) to use in a new S/E row. However, that is not very practical. This is why the next method, "modify", exists. Use this method when you have a new total value (for Spent, Estimate or Remaining) and do not want to do the mental math you would need with the previous method. 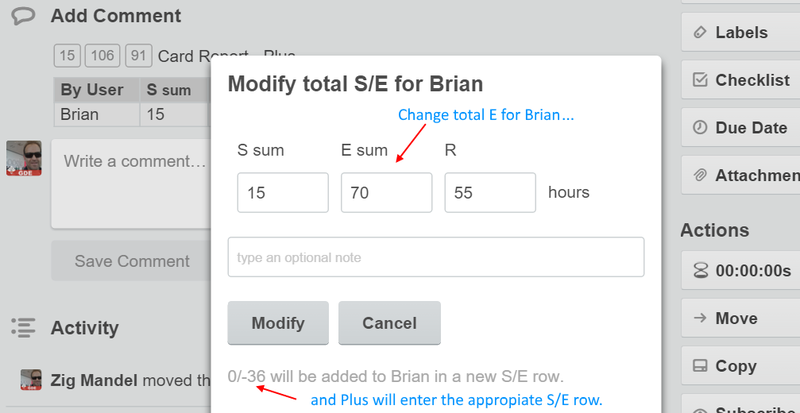 Keep in mind that Plus for Trello always adds new S/E rows, even when making a correction to a previous row. By doing it this way, you have full accountability and traceability of all changes by doing Plus reports. If you need to undo a Spent of "1", you need to enter a new row with Spent "-1" so it cancels out the previous row. "Modify" automates this process for you by generating the correct new S/E row based on the total S/E/R values you change. Once a user has S/E entered with the previous method in that card, the card front shows a mini report of total S/E per user. As the light-blue help text shows, Plus will do the math and enter the needed S/E row to get to the total you typed. You may change Spent, Estimate or Remaining. Plus will auto-fill the right values in the other boxes as you type. Press the "Modify" button to save the change. "Modify" is provided as an easy way to make changes but you do not have to use it. You can also enter those needed differences directly with methods 1 or 3. For example, in the case above, "E sum" was reduced from 106 to 70. Thus, if you enter an S/E row of 0/-36 (using method 1 or 3) instead of using "modify", it will have the same result of reducing "E" to 70 for that card and user. This method is only supported in the default sync method by "Trello card comments". When in that sync mode, the other methods (1 & 2) will also use this method by entering the appropriate Trello card comment for you, which becomes a new "S/E row". You can also make those card comments directly even if Plus is not installed, like when using Firefox, Safari or the Trello mobile app. Just make the card comment by imitating the comments that Plus produces when using the other two methods. See card S/E comment format documentation for detailed instructions as it provides advanced features and "plus commands" not available through the other methods 1 & 2. Plus also has a basic mobile app for Android. It does not yet support adding card S/E directly from the app. It will soon. In the meantime it does support opening the card you are viewing from and to the Plus app / Trello app with a single click. Once in the Trello card, add the card comment using the official Trello mobile app or view card S/E using the Plus mobile app. Use Plus together with Butler for Trello to automate time-tracking. See more. Our mobile & web app and Trello power-up work on any phone or browser. Add or view Points/Spent/Estimate per card, pin cards as notifications and more. These methods give those not using Chrome Desktop a very lightweight way to view and enter data.